For other leaf vegetables known as 'Chinese spinach', see Chinese spinach (disambiguation). Amaranthus dubius, the red spinach, Chinese spinach, (simplified Chinese: 苋菜; traditional Chinese: 莧菜; pinyin: xiàncài), spleen amaranth, hon-toi-moi, yin choy, or hsien tsai is a plant species. It belongs to the economically important family Amaranthaceae. This plant is native to South America and was introduced to Asia, Europe and Africa. Usually it grows to a size of 80–120 cm. It has both green and red varieties, as well as some with mixed colors. The green variety is practically indistinguishable from Amaranthus viridis. It flowers from summer to fall in the tropics, but can flower throughout the year in subtropical conditions. It is a ruderal species, usually found in waste places or disturbed habitats. 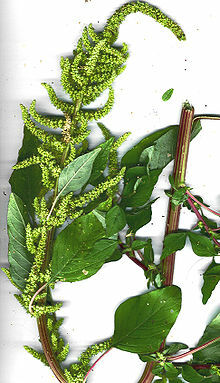 Amaranthus dubius is considered to be a morphologically deviant allopolyploid. It is very close genetically to Amaranthus spinosus and other Amaranthus species. This species is valued as a leafy vegetable throughout South and Southeast Asia and also in Africa. In Cambodia, it is known as "Ptee" (ផ្ទី) where the leaf is used in cooking and to dip in a sauce base call tuk krueng(ទឹកគ្រឿង). In India it is known as Thotakura or Koyagura (Telugu), Cheera ചീര (Malayalam), Dantina Soppu (Kannada), Maath (Marathi),Bhajji (konkani), Chauli or Chavleri Sag (Hindi), Chalai (Punjabi), Kuppai Keerai or குப்பை கீரை (Tamil) or lal sak(Bengali). In Pashto language it is called "Ganhar". It may be eaten raw in thoran or cooked in curry and bhajis. In the Bantu-speaking regions of Uganda it is known as Doodo and is commonly cut very finely and cooked with onions and tomatoes or sometimes mixed with a peanut sauce. It is called Mchicha in Swahili and is known as 'Terere' amongst the Kikuyu, Embu and Meru of Kenya, and as Telele by the Kamba of Kenya. In Indonesia, the bicolor variety (green with red streaks) is known as Bayam and in Thailand as ผักโขม (Phak khom). In Suriname, it is called klaroen. It is used as an herbal remedy in traditional African medicine. In natural Medicine, it is used along with garlic, ginger, and cumin to cure gastric problems. ^ Grubben, G.J.H. & Denton, O.A. (2004) Plant Resources of Tropical Africa 2. Vegetables. PROTA Foundation, Wageningen; Backhuys, Leiden; CTA, Wageningen. ^ "Arai Keerai Benefits in Tamil - Tamil Desiyam". Tamil Desiyam. 2018-08-17. Retrieved 2018-08-17. This page was last edited on 9 April 2019, at 14:07 (UTC).